To most people, the word “pollinator” is synonymous with the word “bee,” but only a fraction of plants are pollinated by bees. 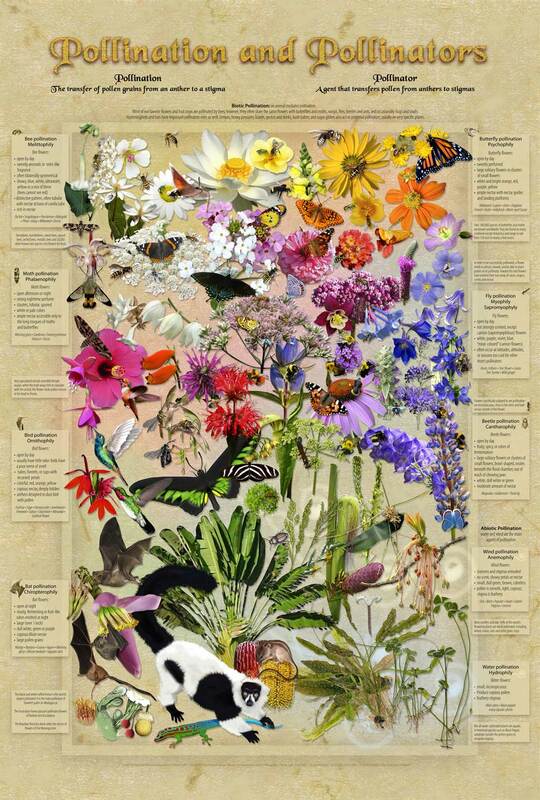 In fact, many different insects and mammals are pollinators—bats, birds, beetles, moths, and more. 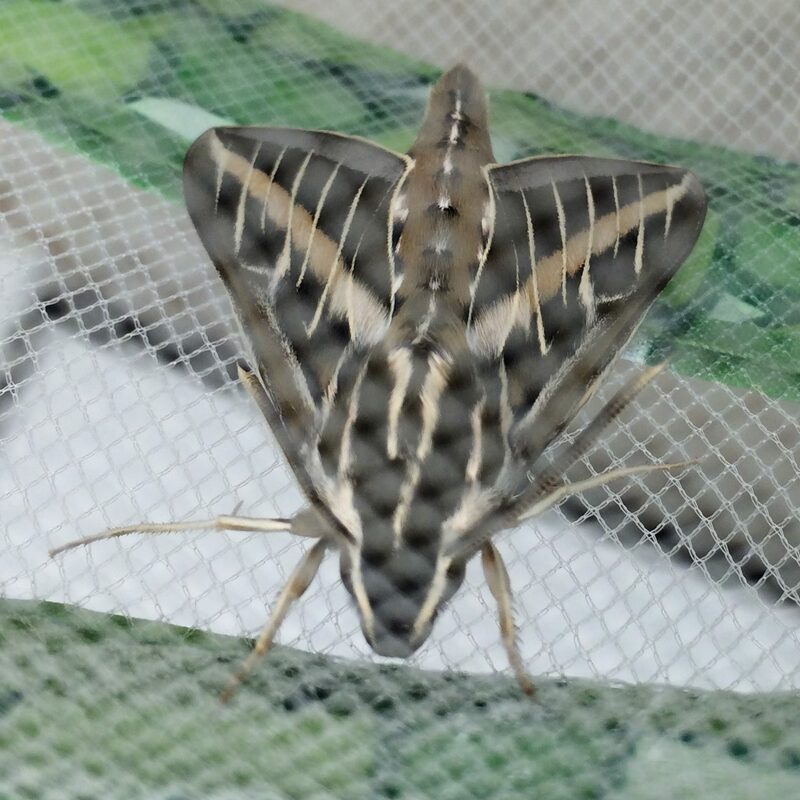 As part of National Moth Week, we wanted to highlight our work on a very special group of moths: the Sphingidae, or hawkmoths, which pollinate more than 106 plant species in North America alone, and many more around the world. I am a research tech in the Skogen lab. I work with Krissa Skogen, Ph.D., her postdocs Tania Jogesh and Rick Overson, and fellow Garden scientist Jeremie Fant, Ph.D., on a National Science Foundation Dimensions of Biodiversity project entitled, “Landscapes of Linalool: Scent-Mediated Diversification of Flowers and Moths across Western North America.” Our project looks at floral scent and pollination in the evening primrose (Onagraceae) family. Many species in the evening primrose family are pollinated by the white-lined hawkmoth (Hyles lineata). This pollinator is also an important herbivore! Female moths lay eggs on evening primroses, and their hungry caterpillars feed on the leaves, buds, and flowers. How does scent play a role in attracting hawkmoths? Do moths use it for pollination? Or do they use it to find host plants to lay their eggs? Or maybe both? 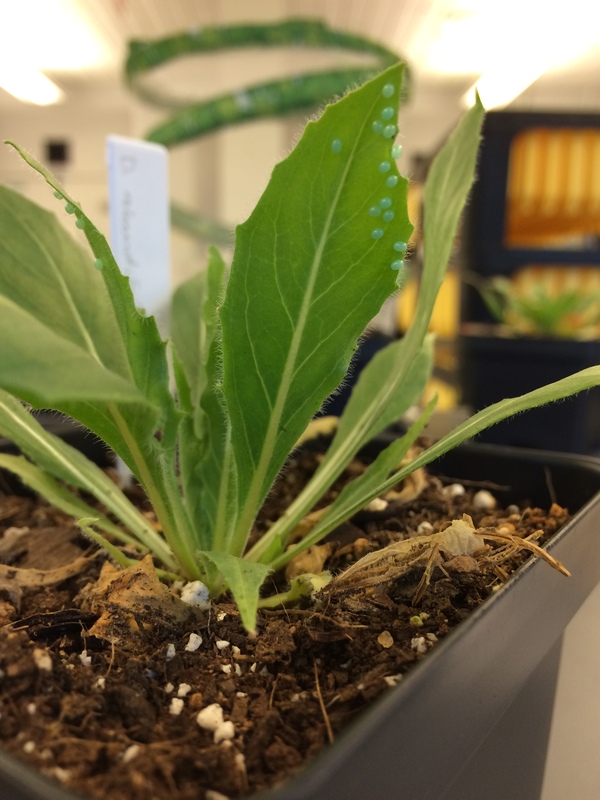 This summer, along with Victoria Luizzi, a summer REU student from Amherst College, we looked at which plants female moths prefer to lay their eggs on—plants from populations containing linalool, or plants from populations without linalool. To answer this question, we first went to Colorado (where the plants naturally grow) and got plants from two different populations, one population that we know produces linalool and another we know doesn’t. 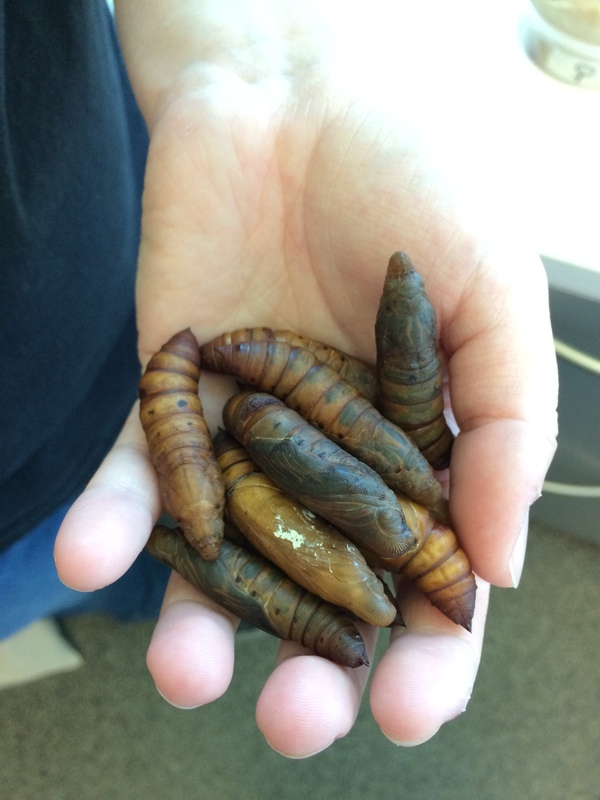 Meanwhile our collaborator, Rob Raguso at Cornell University, sent us hawkmoth pupae and we patiently waited for them to emerge. 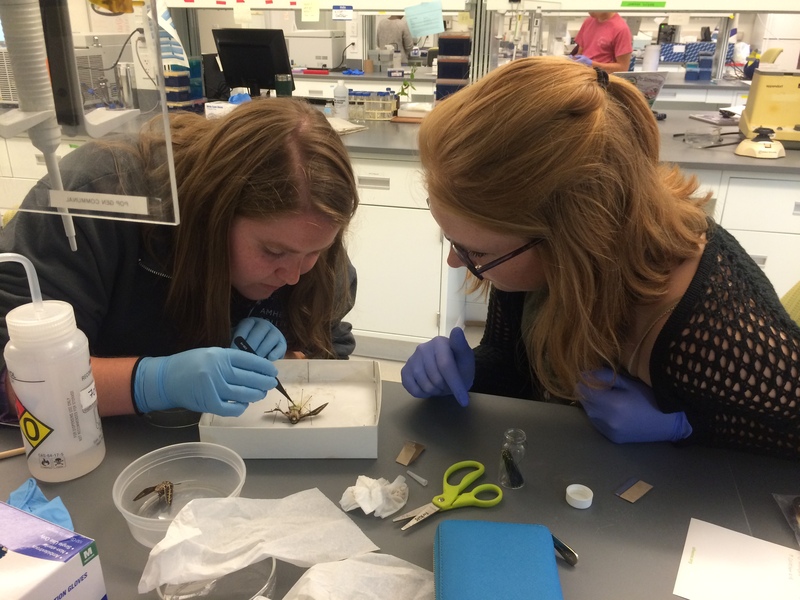 Victoria Luizzi (left) and Andrea Gruver (right) dissect a female moth to count remaining eggs. When the moths emerged they were placed in mating cages. Once mating occurred, females were transferred to a quonset in the evening that contained four plants from the linalool population and four plants from the non-linalool population. The moths were left overnight so the females had plenty of time to choose where they wanted to lay their eggs. The next morning, Victoria counted the eggs on each plant (which was sometimes hundreds!) to see on which plants the females were choosing to lay their eggs. In addition, we dissected each moth to see how many eggs the female did not lay. Over the course of the project, 12 females were flown in the quonset. Overall, the moths showed a preference for plants from the population that produces linalool. These data suggest that plants risk inviting foes while advertising to their friends—but we’ll need to collect a lot more data to be certain. Ultimately, both the insects that pollinate flowers as well as the insects that eat them might determine how a flower smells! 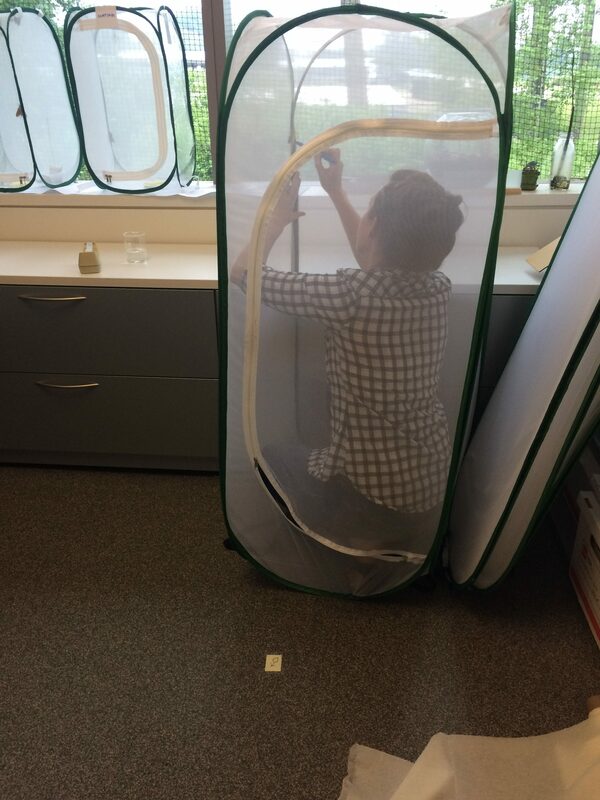 We hope to continue this study to test our hypothesis further and learn more about how scent influences hawkmoth behavior, and how hawkmoth behavior influences floral scent and other floral traits of the plants they pollinate. I hope you are doing research on the hawk moth that pollinates the Eastern Prairie Fringed Orchid. It is a beautiful orchid that is endangered in Illinois and Federally threatened in the USA. A major problem is there are not enough hawk moths to pollinate this beautiful orchid. People actually hand pollinate this plant.